Offering high capacity pick-up and superb in field performance, these balers make quick work of silage, hay and straw. Designed to produce high quality 4 ft. x 5ft. 5 in. and 4 ft. x 6 ft. bales, these round balers are equipped to handle all types of crops and can take on the most demanding field conditions. 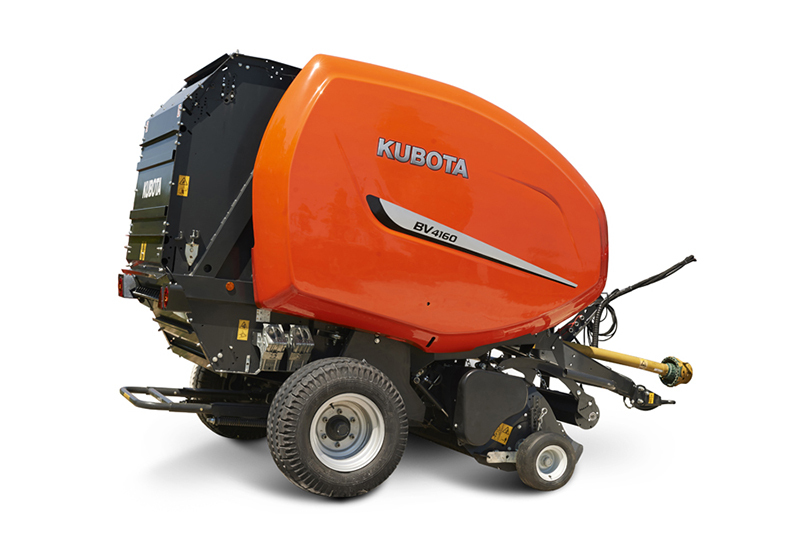 Along with proven durable design, Kubota's 4 ft. x 5 ft. 5 in. and 4 ft. x 6 ft. balers offer a variety of hard-working standard features, including being Silage capable. REDUCED MAINTENANCE: The main bale chamber drive is a heavy duty pitch chain. This allows for a longer lifespan and reduced maintenance. The split drive gearbox ensures that power is distributed evenly, reducing wear and power requirements. TWINE TYING (BV4160 PREMIUM AND BV4180 PREMIUM ONLY): Automatic twine tying with the fast acting double tube system means simultaneous binding of both edges of the bale, keeping binding time to a minimum. Over crossing of twines in the center of the bale provides no loose ends at the end of the binding cycle. HIGH CAPACITY PICK-UP: These balers feature a 4 bar 79 in. heavy duty pickup. The low profile pickup is designed with closely spaced tines which provides for a very smooth flow of crop into the baler. This design provides unparalleled pickup capacity, from light windrows all the way up to heavy silage windrows, and can easily be seen from the tractor. FOCUS III CONTROL TERMINAL: The Focus III Terminal is a universal control terminal which can be used with other Kubota implements. It gives you full control of all functions from the tractor cab, shown on a high density digital color display. The Focus III terminal monitors and controls all necessary functions with all relevant parameters/information visible at a glance. The control box is also driving the binding automatically without any intervention from the operator. POWERBIND NET WRAP: These balers come with Kubota's patented PowerBind net wrap system. This technology has allowed Kubota to get away from the old feed rollers and eliminate many high wear items. The net is fed directly into the bale chambers by injection plates. This design keeps the net tight at all times, which provides accurate and extremely reliable net injection. In addition, the PowerBind net system is extremely simple with a very low loading height (no tools required). FORK FEEDER: Kubota's BV4160 and BV4180 Premium models are fitted with an efficient fork feeder intake system. This system provides a direct feed into the bale chamber. The wide opening allows almost unrestricted intake capacity for a fast and efficient baling process. In conjunction with a crop deflector, the fork feeder ensures a consistent crop flow into the bale chamber, which ensures high density bales. These models come with a 79 in. pick-up. BALING CHAMBER: Kubota BV4160 and BV4180 Premium bale chamber offers a combination of 3 rollers and 5 wide laced belts. This mixed chamber ensures a smooth bale start whatever the crop type, offering smooth bale rotation and reduced crop loss even in dry conditions. As the bale grows, the belt tensioning arm is subjected to steadily increasing resistance from two hydraulic cylinders and a spring tensioner – as the bale diameter grows, so does the bale's density. Diameter - 31 in. (787 mm) min. - 71 in. (1,803 mm) max.